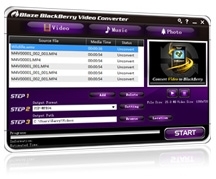 BlazeVideo BlackBerry Video Converter is a professional conversion tool for BlackBerry. User-friendly interface, high conversion speed, no complicate setting needed, greatly expand your enjoyment on your BlackBerry. BlazeVideo BlackBerry Video Converter is a professional conversion tool for BlackBerry. User-friendly interface, high conversion speed, no complicate setting needed, greatly expand your enjoyment on BlackBerry.